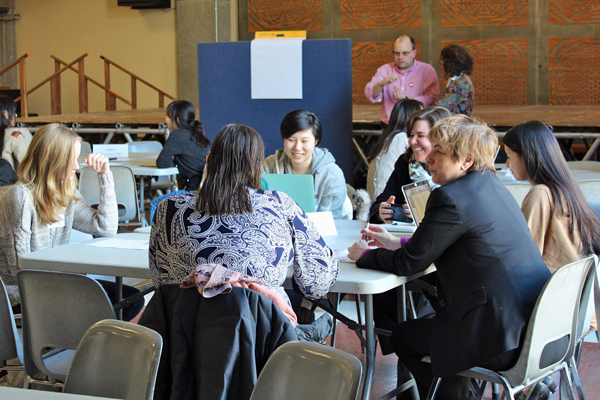 McGill's first Hot Button Issues forum provided a variety of ethical case studies for discussion at various tables. Topics ranged from genetically modified organisms (GMOs) to the use of big data; dual-use research, where results could be used for good or evil purposes; the ethics of programming driver-less cars that need to make decisions autonomously in the case of an impending accident; bio security; and military robots. About 30 members of the McGill community gathered in the Student Centre ballroom Wednesday afternoon to tackle some Big Ethical Questions related to research and responsibility. The first Hot Button Issues forum, organized by Deputy Provost (Student Life and Learning) Ollivier Dyens and Dean of Students Andre Costopoulos, provided a variety of ethical case studies for discussion at various tables. Topics ranged from genetically modified organisms (GMOs) to the use of big data; dual-use research, where results could be used for good or evil purposes; the ethics of programming driver-less cars that need to make decisions autonomously in the case of an impending accident; bio security; and military robots. Participants considered the ethical dilemmas researchers might experience when trying to balance the objective of expanding knowledge with the consequences, often unintended, of that knowledge being used for other than the intended purposes. “Ethical norms are a cornerstone for conducting effective and meaningful research, and, generally speaking, the role of the University is to anticipate the various ethical issues in conducting research,” said kick-off speaker Vice-Principal (Research and International Relations) Rosie Goldstein. “We take this role seriously – ethical lapses in research can significantly harm human and animal subjects, students, and the public. Goldstein said there are good reasons why the ethical behaviour of researchers is under unprecedented scrutiny. She said it’s important to understand that McGill does not directly fund research itself, but supports researchers in their efforts to obtain external funding, largely from government, for their work. McGill’s researchers are guided in part by the University’s Regulation on the Conduct of Research, which establishes a general framework for the conduct of research, and which is currently undergoing a triennial review. 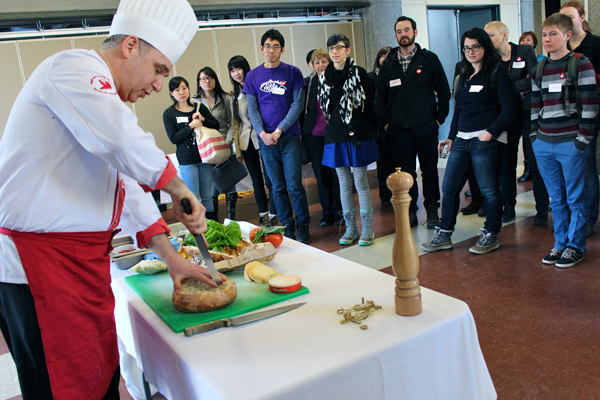 In the middle of the event, McGill’s Executive Chef, Oliver De Volpi, provided a demonstration of how to prepare a fabulous sandwich, offered fair trade bananas and brownies, coffee and a tasty homemade tomato soup plus the sandwich to the intrigued and suddenly hungry participants. Costopoulos summed up the discussions he had heard through the two-hour event, noting he had picked up some common themes are various tables where different topics were discussed. These included values, costs versus benefits, making decisions consistent with values, equity and unintended consequences and responsibility – we can’t always control how research is used. “If we can’t control the unintended consequences, how should we approach our work as scientists,” he asked. And one of the big questions that cropped up at both the discussions concerning the development and deployment of GMOs and the programming decisions required for equipping an autonomous (driver-less) car with the intelligence it needs to function, was: who decides? Who bears the responsibility for the consequences, intended or otherwise, of scholarly research? The researcher? The end user? Someone in the middle (like a corporation or product producer)? “Do we have the right to alter the genetic makeup of a species?” Chris Buddle, a professor of forest insect ecology at Macdonald Campus, asked during a discussion about using genetically modified mosquitos to render other mosquitos unable to reproduce. While we’d all like to be free of such things as mosquito bites and malaria, there are other consequences of wiping out a mosquito population, as they are part of the food chain for such species as bats and fish. The discussions continued during a reception for participants at Thomson House. And they will continue to take place for a long time to come. We had some an intellectually stimulating time. It was rewarding. When is the next forum going to be?